Retired Vancouver Police officer Sam Watson has little use for religion. When his only son, Jeff, commits to missionary service in Thailand, Sam is understandably upset. An uneasy long distance relationship continues until the unthinkable happens: Jeff is murdered. The mission organization wants nothing to do with the investigation and the Thai Police seem unable or unwilling to solve the crime. Sam finds himself in Thailand seeking his son’s killer but also grappling with loss, culture shock and, ultimately, the meaning of his son’s short life. There is a book trailer for this novel that can be viewed on YouTube. eBook versions of “A Walk in the Thai Sun” can be purchased through Amazon and Kobo and it is also available through Overdrive for ePub library purchases. 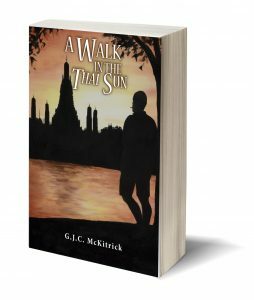 Those wishing a paperback edition of “A Walk in the Thai Sun” should contact the author. The cost is $15 plus postage.